While Luke Jackson is unbeaten in 16 professional fights, he will have an ultimate test for an ultimate reward on Aug. 18, when he challenges Carl Frampton for the interim WBO Featherweight Title. Frampton has lost just once in 26 bouts, won championships at both super bantamweight and featherweight, and he is widely regarded as one of the best boxers in the world. Frampton, in fact, already has plans to capture more featherweight gold to grab a trilogy bout with Leo Santa Cruz. 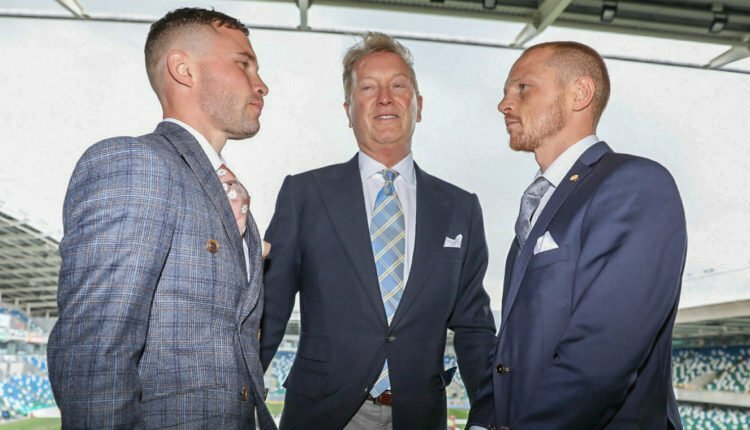 While Jackson may have a slight height and reach advantage against Frampton, the 33-year-old is still considered a heavy underdog due to lack of experience. But that isn’t getting to Jackson, who doesn’t mind having the label attached to him. “Of course he’s the favorite and he deserves to be the favorite,” Jackson said. “But I don’t really care. It’s a fight, it’s a 50-50 fight because its two people and we’re going to go out there and try and win the fight. He’s a very good fighter, I’ve said that from the very first press conference. I’m going to have to go out and do something special to beat him. But I believe I can do that. For Jackson, getting a win would not only be considered a big upset in boxing, it would put him on a platform of Australian boxing world champions including Jeff French, Kostya Tszyu, Lionel Rose and Hector Thompson. It would be a dream come true. Something that I’ve worked very hard to get. It’s a real-life Rocky story isn’t it I’ve just got to go out and win the fight now.